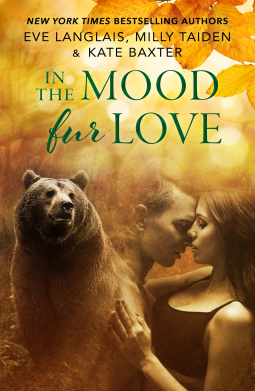 In the Mood Fur Love is a collection of novella length paranormal romances from bestselling authors Eve Langais, Milly Taiden, and Kate Baxter. Each story focuses on mated pairs finding their one true love while facing personal trials or danger. I love the idea that in these romances a HEA comes from the most unexpected circumstances. If you'd love a quick walk on the wild side, then this anthology is just for you! This is the cute read of the stories! Stavros is a humorous bear that finds his fated mate bloodied and bruised and hiding in a dirty alley. One touch and he's determined to save her from whoever is hunting her. Becka may have been held prisoner for two months but she wasn't afraid to fight for her freedom. She was more concerned about putting innocent people in danger, even if those innocent people were actually a clan of bears. I loved her attitude which contrasted with Stavros because she was so pragmatic to his fearless confidence. Bearing His Touch is the fun and humorous opening to the compilation! I wasn't crazy about this story and out of the three it was my least favorite. It was interesting, but a little confusing in the beginning. I felt like I was dropped in the middle of a bigger story because all the characters seemed to know each other and there were a lot of pointed references to established friendships. Shawna was a little prideful, but her compassion for those in trouble made her a perfect match for Hawke, who also looked out for those in need on a grander scale. Even for a novella the story felt rushed. The closing story of the novel has classic paranormal romance written all over it! Colin and Ellie don't have the greatest meeting, but once Colin's wolf recognizes her as his mate all bets are off. Ellie has been cursed by a witch and doomed to live forever in Lowman, Idaho, unable to age or die. But once Colin learns of her fate, he'll do anything to help her. I love that in order to save her they go off on a quest of sorts. There's danger all for just the possibility that they'll be able to break the curse. Even if Colin can help Ellie he still has to worry about his position in the pack. All in all, this was definitely a well-rounded romance!